Most of Russia’s current investment in the DPRK has been limited to Rason: Rason Port, Rason-Russia Railway. But there has been movement in bilateral relations this year. In March of 2014, the North Koreans and the Russians announced bilateral trade would be conducted in Rubles and they discussed additional economic opportunities: Inter-Korean transportation, gas pipeline, and the Kaesong Industrial Complex. Russian construction compnay NPO Mostovik has developed a plan of designing and upgrading railways and ore enriching plants, as well as developing and processing natural resources in North Korea, CEO Vladimir Shishov told PRIME on Monday. “These are two interconnected and quite complex processes. But the NPO has lots of experience in designing, and we will promote our experience and technologies in this region,” Shishov said. About 7,000 kilometers of North Korean railways require modernization, and 3,500 kilometers of them must be modernized urgently. North Korea “has a large industrial and economic potential, the realization of which requires solving infrastructural problems.” Without the development of railways and roads and electrification, “it is impossible to solve the whole range of tasks, connected with the development of North Korea’s economy,” he said. Pyongyang, October 23 (KCNA) — Talks between Minister of External Economic Relations Ri Ryong Nam who doubles as chairman of the DPRK side to the Inter-Governmental Committee for Cooperation in Trade, Economy, Science and Technology between the DPRK and Russia and Minister of Development of Far East of Russia Alexandr Galushka who doubles as chairman of the Russian side to the committee were held here on Thursday. Present there from the DPRK side were Ju Jae Dok, vice-minister of Railways, and officials concerned and from the opposite side were the party of the minister of Development of Far East, Alexandr Timonin, Russian ambassador to the DPRK, and a staff member of his embassy. Discussed at the talks were the issues of boosting the economic and trade cooperation between the two countries. Pyongyang, October 26 (KCNA) — The delegation of the Ministry of Railways led by Minister Jon Kil Su returned home Sunday after taking part in an international seminar held in Sochi, Russia. A ground-breaking ceremony of rebuilding the section of Jaedong-Kangdong-Nampho railway stations took place at East Pyongyang Railway Station Tuesday. Present there were Minister of External Economic Relations Ri Ryong Nam who doubles as chairman of the DPRK side to the Inter-Governmental Committee for Cooperation in Trade, Economy, Science and Technology between the DPRK and Russia, officials concerned and working people in the city. Also on hand were Minister of Development of Far East of Russia Alexandr Galushka who doubles as chairman of the Russian side to the Inter-Governmental Committee for Cooperation in Trade, Economy, Science and Technology between the DPRK and Russia, and his party, Alexandr Timonin, Russian ambassador to the DPRK, staff members of his embassy and foreign diplomatic envoys here. Oleg Shishov, director general of the Russian Bridzh Group, and Won Phil Jong, senior vice-minister of Railways of the DPRK, made speeches at the ceremony. They said that they were pleased that the ceremony of weighty significance in economic development between the two countries was being held in Pyongyang this year marking the 66th anniversary of the establishment of diplomatic relations between the DPRK and Russia. The project for remodeling railways, the first stage of realizing the large-scale cooperation project which is in line with the common development and interests of the peoples of the two countries, marked an important occasion in developing economic cooperation between the two countries, they noted. Alexandr Galushka and Ri Ryong Nam made congratulatory speeches. They said that Marshal Kim Jong Un is paying deep attention to boosting the bilateral friendly relations. The relations of economic cooperation between the two countries are growing stronger with each passing day, they said, hoping for bigger successes in the work to develop the bilateral cooperative relations in the future, too. A reception was given that day. 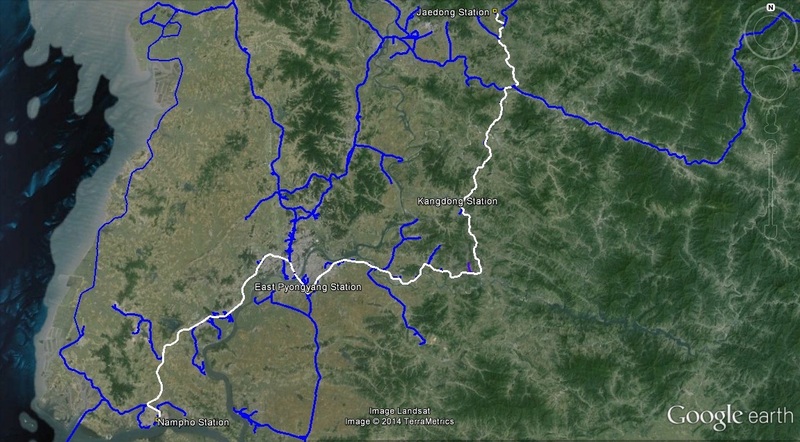 A Russian broadcaster earlier reported that Pyongyang and Moscow signed a US$25 billion deal to modernize a combined 3,500-kilometer stretch of railways in North Korea. If confirmed, it would cover 60-70 percent of the North’s railways. The implementation of the Russian-North Korean project Pobeda (Victory) will make it possible for North Korea to start exporting metallurgical coal in 2015, one of the participants in the project, LLC NPO Mostovik CEO Oleg Shishov believes. “We’re already discussing this with the North Korean government, that everything will go to [third countries], and they agree. The volume is tens of millions of tonnes at the initial stage, and then we’ll see. Let’s take the first step,” Shishov told reporters. He said the North Korea stands out by its almost complete absence of sulfur. “This is a very important indicator for metallurgical production, particularly for production of high quality steels,” Shishov said. “Mining is already underway there, only with such methods that little is being mined. the methods are very inefficient, unproductive. Modern mining equipment will be delivered there and this will increase production manifold. The reserves there are huge,” Shishov said. He did not specify who would be investing in the development of North Korean coal fields or the countries that would be importing the coal. Russia and North Korea are now beginning to implement the Pobeda project, which calls for the development of mineral resources and comprehensive reconstruction of North Korea’s railway network. A number of Russian companies are participating in the project, including Mostovik. The other participants have not been named. The total length of this route is approximately 175km. The obvious interpretation of the image is that the railway renovations will be used to facilitate coal exports. Jaenam Station exclusively serves the Sinchang Youth Coal Mine under the Sunchon Area Youth Coal Mine Complex Enterprise. Additoinally, the area surrounding Jaenam Station is doimated by coal mines. 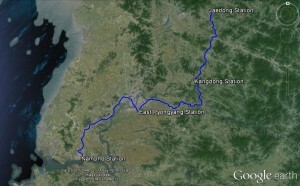 The Kangdong Station is not in the town of Kangdong, but just to the east where it services the Kangdong Area Coal Mine Complex Enterprise. Coal in these areas will supposedly be carried more efficiently to the port of Nampho where a coal terminal already exists. If indeed this is the primary purpose of the project, then the obvious loser will be China (on multiple fronts). Currently Chinese state-owned mining companies are the only serious investors in North Korea’s extraction industries. Because of their unique relationship with and proximity to the DPRK, they are able to purchase coal and other resources at a bargain price (monopsony). North Korea can only strengthen its bargaining position with these companies by finding other buyers of its produce. Russia’s investment could help them accomplish this goal. However there are two domestically-related uses that renovation of this railway route could facilitate. The first is domestic steel production. Russian sources highlight the importance of sulfur-free coal for the production of steel, and this railway line passes directly by the Chollima Steel Mill, one of the largest smelters in the country. Increased steel production has long been a goal of North Korea’s economic policymakers going back to the “heavy-industry” days of the 1950s. With a renovated railway track that connects the correct kind of coal with Chollima Steel Mill, the DPRK may be able to produce more steel for both domestic use or for export. A second potential domestic use could be the increase in energy supply to Pyongyang. As I highlighted in 38 North, the DPRK is constructing a new coal power plant in Kangdong. This new power plant, as well as the Pyongyang and East Pyongyang Thermal Power Plants lie along the Jaenam-Nampho line. Increased coal supplies to these mills could have significant impact on power supply in Pyongyang. Are there any other potential uses? Maybe, but these are more difficult to see right now and may only become evident at a later date. After examining the composition of facilities along the track between Pyongyang and Jaenam, I cannot identify any other specific industries that may benefit, other than potential military factories that lie along the route. These, of course, are worth of examination, but I am not the most qualified to carry that out. On November 6, 38 North Published this article on DPRK-Russia relations. This entry was posted on Sunday, October 26th, 2014 at 2:06 pm and is filed under Coal, Energy, Foreign direct investment, International trade, Railways, Russia, Transportation. You can follow any responses to this entry through the RSS 2.0 feed. Both comments and pings are currently closed.